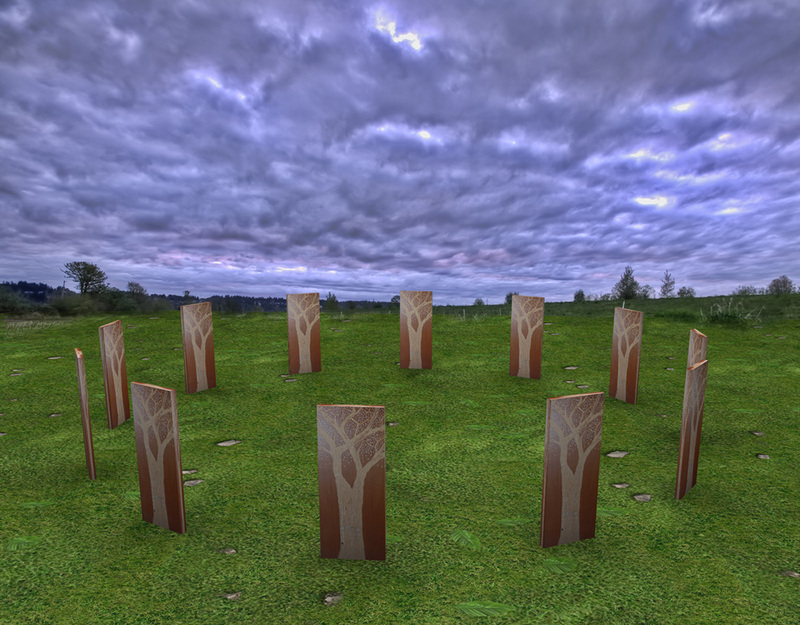 Installation of a large scale Woodhenge within Rainbow, creating a gateway to our ancestors, the natural world, the universe and expanded states of consciousness. This work has been strongly influenced by the latest archeological discoveries at Stonehenge World Heritage Site in Wiltshire, England. These new discoveries have shown the ceremonial and symbolic connection of the Woodhenge and Stonehenge structures. 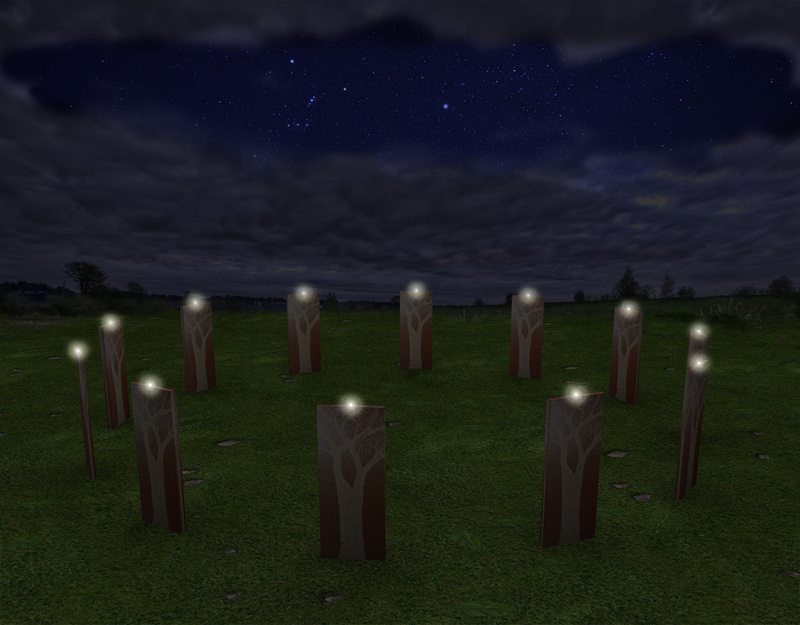 Woodhenge was the place symbolizing birth, constructed from organic material (wood). Ceremonies then lead to the death phase within Stonehenge, constructed from inorganic material (stone) to further symbolise death. The annual ceremonies within and between the monuments symbolised life’s journey from birth to death and were structurally aligned with the Northern Hemisphere’s summer solstice and other celestial events which archeologists are still discovering information about. 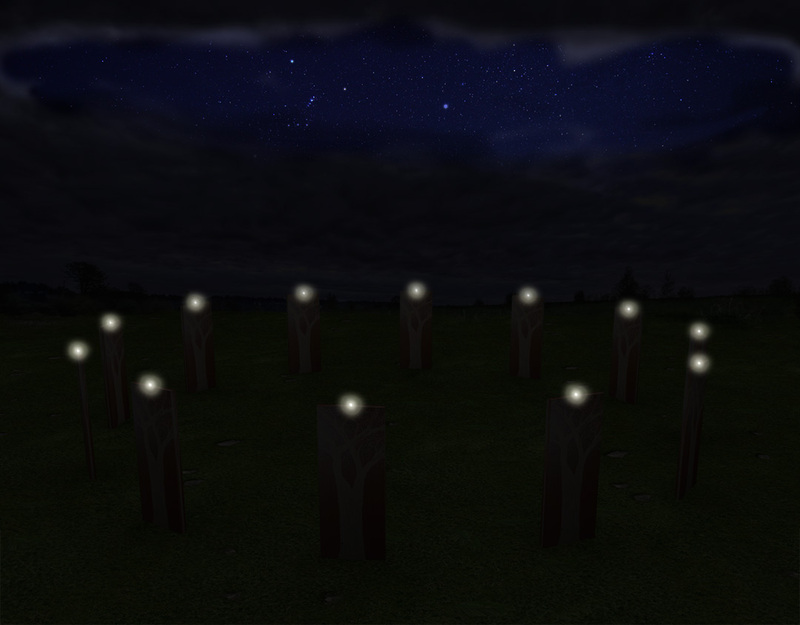 Woodhenge’s have been found in other parts of the ancient world with woodhenge sites such as Moorehead, Ohio and Cahokia in Illinois. Woodhenges were built for spiritual ceremonies and likely involved dance, music and altered states. 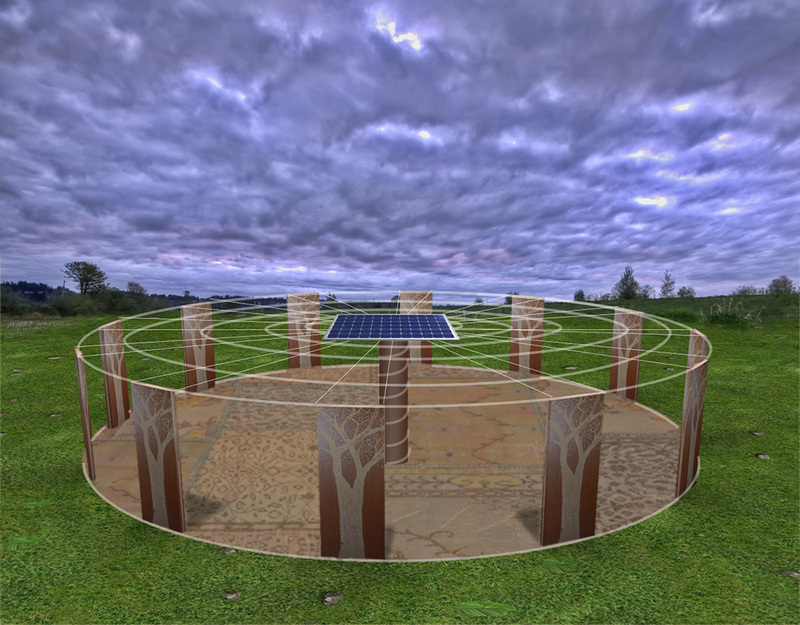 The Doorhenge will be integrated within the heart of the Rainbow ceremony and create space for spontaneous group and personal ceremonies over the duration of the festival. The floor will be covered with used carpet making a comfortable surface to sit on. In case of rain, the carpet will protect the surface from foot traffic, reducing mud. The number 12 was chosen to symbolise the passages and cycles of time; 12 months of the calendar, 12 hours of the clock. The physical doors create a direct link to Aldous Huxley’s work “The Doors of Perception” . The doors will symbolise the journey through the physical, spiritual and hallucinatory realms. The doors will be carved on both sides with images of trees which will symbolise life, growth and connection with the Earth’s diverse living beings. As a whole, the doors will symbolise an interconnected forest. The spiral formation has a long symbolic history in human society’s and is probably the oldest known symbol of human spirituality. It symbolises the journey and the source of life, our DNA. 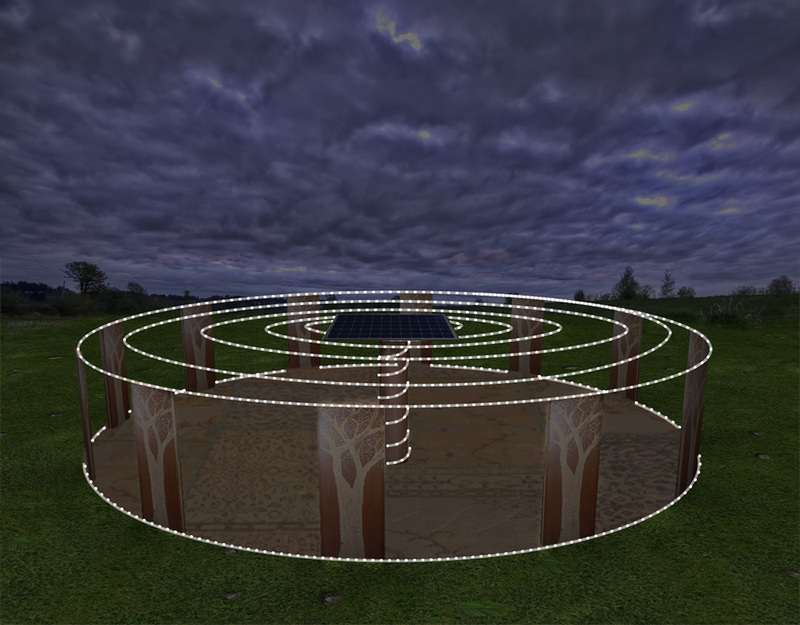 The spiral creates a further link to the woodhenge theme as spirals were used commonly found in context to the stone henges as well as in other ancient cultures such as indigenous aborigines. The spiral also reinforces, the link to the natural world reflecting one of natures beautiful (both aesthetically and mathematically) forms. The Doorhenge can be located anywhere within the festival grounds. The ideal location would be at the bottom of a hill within the main public area allowing close locality for interaction with the installation while allowing people from a distance to see it from the top view (see lighting). If the “non-solar” version is selected, then the Doorhenge will need to be located in proximity to a power source. The installation will be feature 100 metres of rope lights positioned in a spiral. 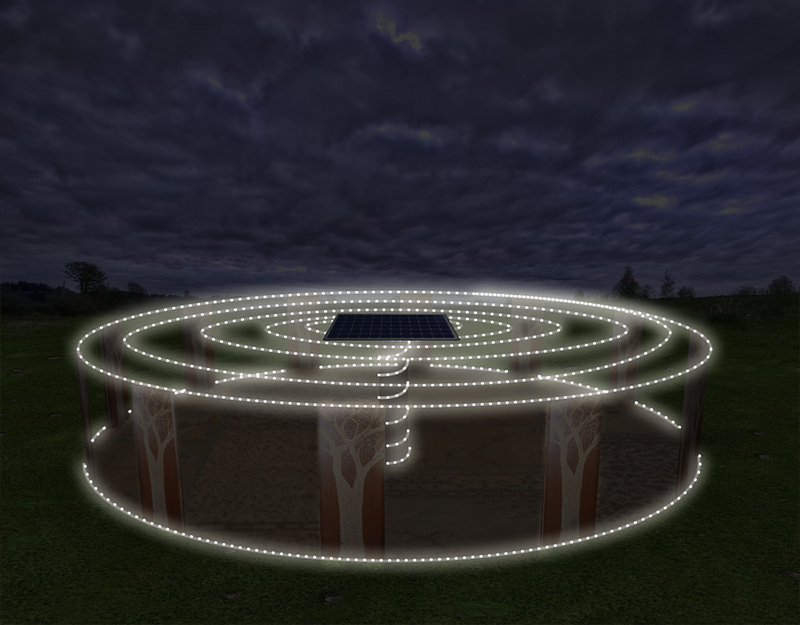 The lights will be on the “Chasing Flashing” setting, meaning the light will travel through the spiral from the centre, out the edges where it will spin around the circumference. An additional 30 metres of rope lights will be positioned around the footing of the circumference giving it a three dimensional effect. 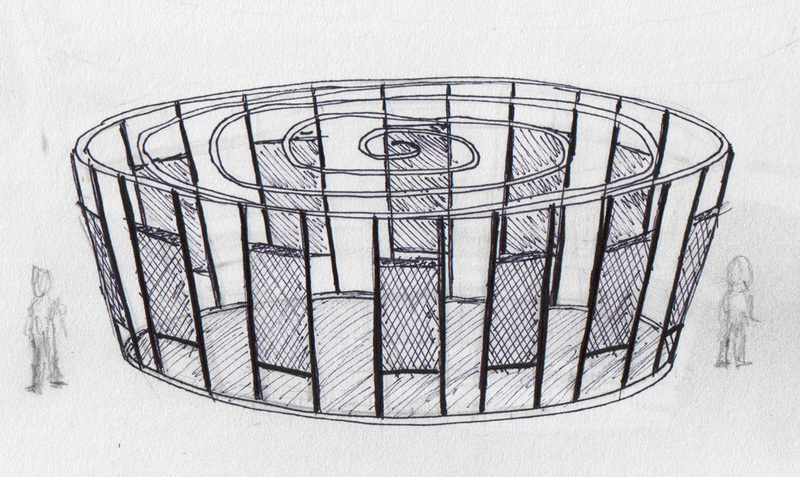 From an elevated view in the distance, the installation will look like giant spinning spiral cylinder. Standing within the installation will heighten the visual effect on the viewer as they will be inside the spinning cylinder. The installation has been designed to withstand extreme heat, rain and wind. The main structure is built with doors that are anchored with star pickets. This structure has a low surface area for high winds with a high structural strength. The roof structure will be supported by high tensile ropes anchored to two points via steel eyes on every door (24 anchor points). This structure will be stronger than is required to support the reasonably light rope lights. The lights conform with Australian safety standards, are water resistant and UV protected. All electrical connections will be enclosed in weather proof casings. All power connections will be connected at the top of the structure, out of reach of the public. Top ropes and rope lights will be above reach. For the powered version, the extension lead to the power source will be attached at the top of the door across to the power source, meaning no power leads on the ground. This lead will be re-enforced using rope. The installation will generate its own power through out the festival.